A sophisticated online temperature monitoring and alerting device. 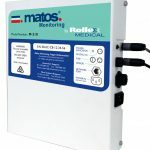 MATOS® Monitoring can now be retrofitted to any fridge, freezer, cool-room or airspace. This can be achieved with the use of our new MATOS® M-310 stand-alone monitoring unit.